Leg cramps at night are defined as spasmodic, painful, involuntary, contraction of skeletal muscle that occur during the night when a person is sleeping, causing sleep disturbances. Although they may occur simultaneously with other sleep disorders, nocturnal leg cramps do not have a causal link to any known underlying medical disorders. Almost everyone have experienced at one time or other leg cramps in night. They predominantly affect the elderly and pregnant women, two groups that tend to have relatively poor blood circulation in the limbs. Taking a step further back, night cramps are found in middle-aged and older populations, although they can afflict individuals of any age group. A reason why a person may get night cramps is because he or she isn't drinking enough water. Water is important for transporting vitamins, minerals,and other substances throughout the body. Hydration is not the same when drinking caffeine or alcohol, since they are diuretics and end up dehydrating a person even further. Muscle needs hydration to function properly; without it cramping is more likely to occur. That is why athletes who do not replenish their water lost from sports and exercise end up with a charley-horse ( Usually people associate leg cramps with the term "charley-horse" ). Likewise, low water intake in an otherwise sedentary person can cause muscles twitches during sleep. Have a balanced diet-consume a high CARBOHYDRATE diet e.g. rice, bread. maintain optimal mineral and electrolyte intake including CALCIUM, MAGNESIUM, POTASSIUM, and ZINC which apparently performs combined roles in the prevention of muscle injury and cramps. Gentle stretching the troublesome calf muscles and/or warming up and cooling down before and after exercise. Do stretching exercises regularly, particularly before bed. 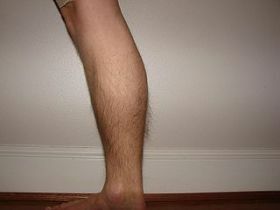 It is thought that regular stretching of the calf muscles throughout the day may help to prevent acute attacks. Some people recommend stretching 3 times daily while others advocated stretching before going to bed. Gently stretching the affected muscle may help to relieve pain and spasm. Apply either ice or heat to the cramped area. Ice works best to relax the muscle and slow down inflammation. Heat is a better choice if you happen to get a cramp in a cold environment. Drug: Quinine-for non-pregnant. Several other drugs have been suggested aspossible treatments including diltiazem,verapamil, and naftidrofuryl. LEG CRAMPS. Calif Med. Mar 1960; 92(3): 204–206.